This New York Times headline is hardly shocking news: Like Subprime Mortgages, Some Construction Loans Are Delinquent. However, the details about what banks are affected and to what extent are rather interesting. Let's take a look. Banks across the United States, particularly the smaller ones, have become dependent on construction lending just as that area of the economy is weakening and the number of bad loans is growing. Such problems are not spread evenly across all banks, of course. “When you look at the regional impact, the areas that were the booming condominium markets, like South Florida, have shown a surge in delinquency rates,” said Matthew Anderson, a partner in Foresight Analytics, a real estate market analysis firm based in Oakland, Calif.
My Comment: Potential bank failures as I have said on several occasions is one message behind soaring LIBOR. When construction loans go bad, they can go very bad, in part because it can take a long time to slow them down after markets begin to weaken. Construction projects, once begun, are useless if not finished. So even though construction spending began to decline in mid-2006, the volume of construction loans on bank books has continued to rise, hitting a record $616 billion at the end of September, up 13 percent from a year earlier. Mr. Anderson estimated that construction loans for single-family homes fell 10 percent over the period, but that was more than made up by increases in loans for condominiums and apartments, and by a surge in commercial construction. My Comment: Lenders have thrown good money after bad and will keep doing so until they are shut down. No one is talking about this, but this is one of the moral hazards of FDIC insured CDs. More on this in just a bit. It is somewhat easier to slow spending on single-family homes, since a developer planning a 50-home project can leave some of the homes unbuilt if demand dries up. But a planned 20-story condominium building cannot be topped off after 10 floors are built. "A lot of the biggest construction lending problems are in markets that are already weak," Mr. Anderson said. "Having weak projects hitting a weak market is just adding to the price pressure in that market." My Comment: Sunken costs are actually irrelevant. All that matters from a pure economic standpoint is whether or not more money will be lost by going ahead vs. stopping the project. In many cases, especially construction of condo towers in Florida and other overbuilt bubble areas, it makes complete economic sense to walk away from a partially built tower than to keep on building and lose even more money. So why is additional money thrown away on absurd projects? Because if funding was shut down, a lender would immediately have to writeoff the loan and face the consequences, including bankruptcy. Highly paid bank executives would lose their salary and stock options. So lending continues until the Office of Thrift Supervision, the FDIC board of directors, or a state regulatory agency finally says enough is enough. In early 1991, in the last big real estate downturn, the percentage of construction loans that were either on nonperforming status or behind in payments hit 18.5 percent, nearly six times the current level. For anything like that to happen now, commercial real estate markets — including office buildings and stores — would have to weaken significantly. My Comment: Given the amount of overbuilding, a massive commercial real estate collapse is given. Furthermore, the combined residential/commercial disaster stands to be far worse than anything we saw in 1991. My Comment: For starters a severe economic recession is a given. Secondly, what good is the Fed or bank regulators if neither has the backbone to do anything? Given the Fed spawned off those problem with absurd interest rates policies, the Fed worse than merely useless. It is purposely harmful and should be abolished. This seems like a good time to review Minyan Mailbag: LIBOR, What's The Big Deal? and Deflationary Credit Downturn Is Underway: "The interaction of M4, M3, the yield curve, and LIBOR both in the US and abroad are signs of an impending major market dislocation or bank failure of some kind." The FDIC is often appointed as receiver for failed banks. The Failed Bank List includes banks which have failed since October 1, 2000. Let's take a look at CD Rates to see who is offering what. With 3 month treasuries yielding 3.07% and the Fed Fund Rate at 4.50% and soon to go lower, Countrywide (CFC) paying 5.30% to raise capital is a sign of desperation for money. Yet, money flows to the most risky investments simply because of government guarantees. Want to know what banks are at risk of failing? Click on the above link and scroll down the list of banks rated 1-3 stars, for a range of products from 1-month to 5 year CDs and those are some of the banks most at risk. Certainly not every bank (or even most of them) in that list will fail. Some banks arguably want to raise capital for valid reasons. 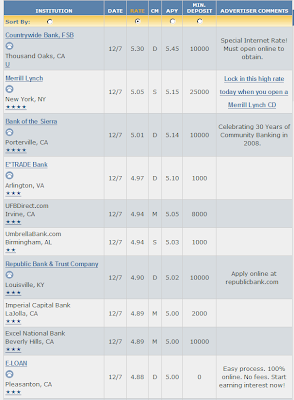 However, more than a few banks in that list are raising money because they have to not because they want to. Many banks need ongoing funding to keep condo construction loans on schedule. And they will keep funding that construction because as long as they do they have a job. And as long as builders get paid they will keep building no matter how little economic sense there is to it anymore. So if you are wondering why the reckless construction loan hit parade keeps on rolling you have an answer: Government intervention into free market economics. Financing those projects would have stopped long ago without FDIC insurance on CDs and without the Fed price fixing interest rates. The eventual taxpayer bailout of this mess grows every day.